3.1 Want reviews of other pre workout products? 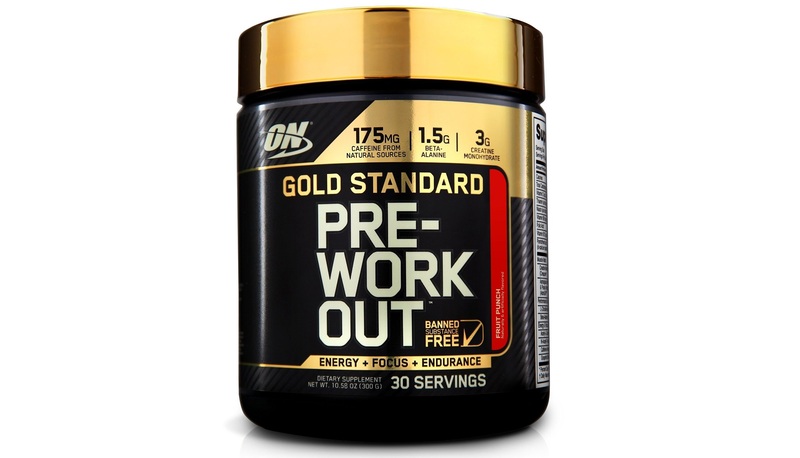 The Optimum Nutrition Gold Standard pre workout is pretty much the pinnacle of no ‘frills’ pre workout supplements. It is one of the most popular and best selling products on the market. 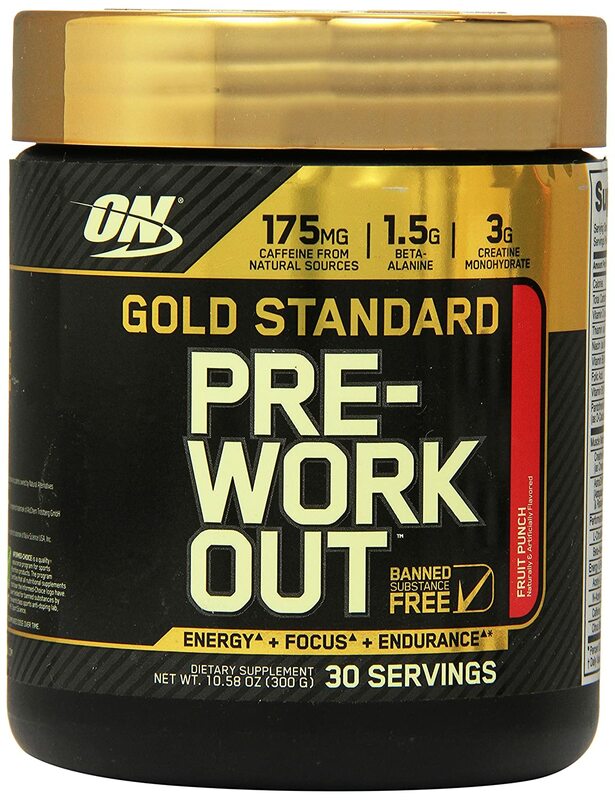 It goes by many different names however the most popular ones are: optimum nutrition pre workout gold standard, optimum nutrition gold standard pre workout, optimum nutrition pre workout and gold standard pre workout. Call it whatever you like but there is no disputing that it is a solid performer in the key criteria of performance, pump, focus, value for money, and taste. There are about a thousand Optimum Nutrition pre workout reviews on the internet so rather than waste your time with another one I’ll just present a summary of the key points. To add to this I’ll provide some background on the ingredients, why they work so well and why I think this supplement is so great. Taste – this stuff comes in a multitude of flavors, all of which are delicious according to the internet. I have only tried the fruit punch and pineapple flavors myself and my favorite is the pineapple. I don’t know why but pineapple is my go-to flavor and I use this as a basis in my head to compare the taste of different pre workouts against one another. If pineapple is not your thing you can also choose from blueberry lemonade, fruit punch, green apple, and watermelon. Composition – It goes without saying that a formula containing the right ingredients in the right amounts is key to the effectiveness of any pre workout supplement. In this department Optimum Nutrition has hit the target almost square in the middle. There are a couple of minor issues which I’ll explain in my personal opinion below but these are by no means show stoppers. Mixability – A few people said in their reviews that they experienced issues with mixing this product. Some said that it didn’t mix well and was a bit powdery in consistency, and others said that there was always a little bit of undissolved product left at the bottom. I didn’t experience this though and would suggest that these people may have either not mixed it thoroughly enough or not mixed it with enough water. Energy – There seems to be agreement across the board that this pre workout drink provides the user with a great amount of energy. It is common with pre workout powders to see a trade off between the amount of energy given and the ‘crash’ one experiences as it wears off however Optimum Nutrition seem to have got it right with this formula and post pre workout blues and irritability are not an issue. Pump – Most users reported a good amount of pump from this product. ‘Pump’ in this context refers to elevated blood flow and vascularity and contributes greatly to muscular performance and endurance. Focus – When some people talk about focus it seems they are referring to their mental motivation and ability to concentrate on and persevere through their workout even when they are fatiguing and it’s getting hard. Other people seem to be referring to the ability to focus on the isolation of specific muscles while performing a given exercise. In both of these categories this product rates well. This is not something people are raving about but it does seem to provide more than adequate focus for most people’s needs. In my mind this is where Optimum Nutrition sets itself apart from the competition and really does make the new ‘Gold Standard’. It contains a broad spectrum of components and most significantly it contains them in almost clinical quantities. Let’s have a look at them in more detail. Everything above the “Muscle Matrix” line is basically a vitamin B complex. B group vitamins are important in the body as they are heavily utilized in the metabolic processes involved in the mechanisms of synthesizing fat, protein and carbs to energy. Branched Chain Amino Acids (BCAA) also rely on vitamin B6 to perform their role in protein synthesis, muscle repair and muscle recovery. It is common to see B group vitamins in pre wokout formulas for these reasons but the inclusion of the vitamin D is where the bonus points are gained. Vitamin D and Pantothenic acid help the body to more effectively utilize the B vitamins so their inclusion is definitely a winning move. Other ingredients they are not stingy with are Beta-Alanine and L-Citrulline Malate. To start with the Beta-Alanine is provided in the form of CarnoSyn which is a special patented that is more effectively utilized by the body. Guidelines for Beta-Alanine supplementation recommend 4-5 grams a day for maximum effect however the reason for taking Beta-Alanine is to increase the amount of Carnosine in the muscles and because CarnoSyn does this more effectively 1.5 to 3 grams is sufficient. The L-Citrulline Malate is one of the most effective substances for pump (increasing blood flow) and 1.5 to 3 grams of this is also reported to be an effective dose. None of the ingredients in the ‘Energy and Focus complex’ are banned or questionable and this is another one of the reasons for the popularity of this product. The Acetyl-L-Carnitine HCI, N-Acetyl-L-Tyrosine, Caffeine and Citrus Bioflavonoids are all proven energy and focus stimulators and the amounts they are provided in is enough to give you that extra bit of motivation without overdoing the central nervous system stimulation which would lead to that jittery feeling and an unpleasant crash after a couple of hours. Extra energy and enhanced workouts are waiting for you. See what other people say! Good article here, as a guy that’s been spending time trying to get in better shape, I have been thinking about incorporating a supplement into my current diet. After looking through your article I think I will finally take the steps to getting some and can thank you for some good information. Thanks Devin, good luck on your fitness journey! This is a great post! I’ve just started working out, and lacking energy early. I’m glad that the pre workout drink provides the user with a great amount of energy. This is what I need. 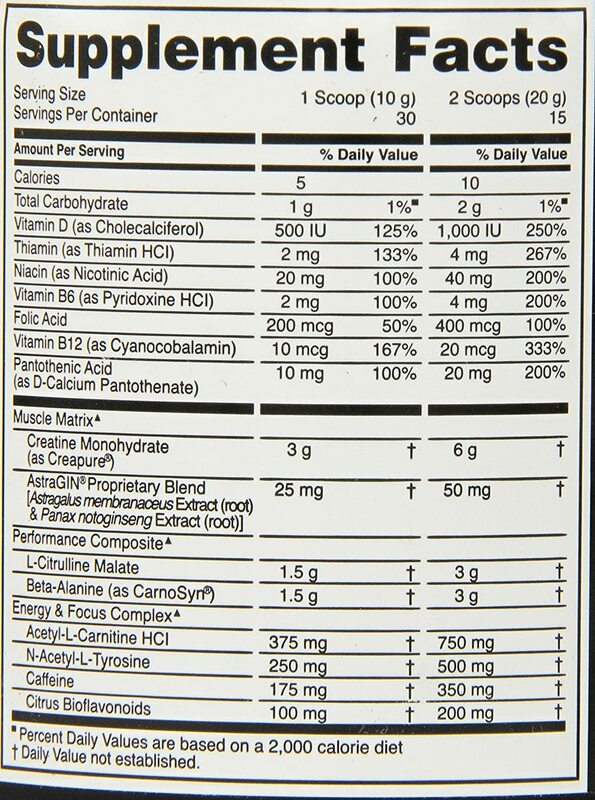 There is so many different ingredients like Acetyl-L-Carnitine HCI, N-Acetyl-L-Tyrosine, Caffeine, crazy. My question is can I take more than 4-5 grams of Beta-Alanine supplementation a day? hi Michael, you can take more than 4-5 grams a day but at this point the benefits will rapidly diminish so there is no point. I’m not a doctor but I believe you would have to take orders of magnitude more than this to become sick though. As someone who has sampled my share of supplements with different results I’m glad to read your review. You have reviewed Optimum Nutrition pre workout so openly that l feel i can trust your judgement. The amazon reviews look well too, and l appreciate you taking your time to put everything together incliding putting together an ingredients background. thanks Roamy I’m glad you enjoyed it! I’m glad I found your post. I’ve been training for over a year now but can’t seem to get the results I want. So I’ve looking into supplements to see if they’ll get me there. You review was very convincing. How would you recommend me to take this supplement? I workout 5x week (HIIT) for an hour, do you think I should start specific weight training? I do some, but not like gym weight training. Looking forward to know your thoughts. Hi Ana, it all depends on the results that you are after but resistance or weight training is one of the most effective ways to increase your strength and speed up your metabolism. If you have limited time you could potentially achieve similar results with a half an hour of resistance training as with a full hour of interval training. HI Brad, thanks for the in-depth, no BS review of this. There’s so much out there these days and I have been thinking about supplementing my diet for a while now. Somedays I feel low on energy but I might look into something like this to combat that and kick me into gear! Hi Stacey, these pre workouts are designed for exactly what you speak of – extra energy and motivation when you’re feeling low. Hope you have success! I have not tried Optimum Nutrition Pre Workout Supplement before but have tried other supplements in the past. I have to say I was glad to see you included taste in your review. Some might not mind but I always did. I have been known to throw away anything I don’t find palatable. Pineapple actually sounds awesome! I have had the mixing issue where the powered remain gritty. Is this something that might blend well in a blender? Perhaps that’s the solution for anyone who finds the same. Great review! Thanks for your comments Heather, I’m glad you found the review helpful. I’ve never used a blender, at most I have stirred it with a spoon. Happy training! Anything that has to do with nutrition and workouts interests me. So your post had my attention from the title! For me, anything I take has to have a good taste and the flavors all sounded good, especially watermelon 🙂 I think with any product, you have to shake it. I shake my drinks each time before I take a drink. A little powdery taste or residue doesn’t bother me, just has to have a good taste. Very informative post! I might have to try. I have bookmarked your site. Thanks! I really like this post as it is very informative. I have tried optimum nutrition and it is a really good pre workout, but I think my all time favorite right now is the Shatter pre workout. 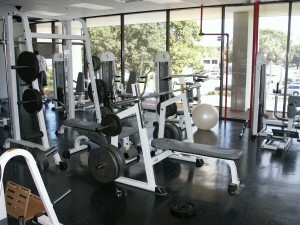 It gives me so much energy almost immediately and the pump is so great. And after the workout I still feel amazing. I usually go back and forth between the two pre workouts as they are both pretty dank. Thank you! Thanks Christina I’m glad you liked it! I have a hard time trusting any supplements. I used to work for a poplar nutrition store and I’ve seen numerous supplements come and go. To me, the majority of them are just as much of a scam as a lot of the work from home programs. I also tell friends and family that if they’re going to buy a supplement, buy one that doesn’t have a lot of flash and pretty colors on the bottle. The ones that are plain and hidden on the back shelves are usually the legit ones. Great post. I jave been looking for something that would give me more energy. I have tried a lot of products that has faild. This seems to be a great product for me to try out. Thanks for the great information. Where is the best place to buy this product? Thanks Jeremy, personally I like to get pretty much everything from Amazon so I don’t have to go to a store, but you can also get it from most supplement stores if you can’t wait a day or two for it to be posted. Happy lifting!